Celebrate mothers who have lost a child. 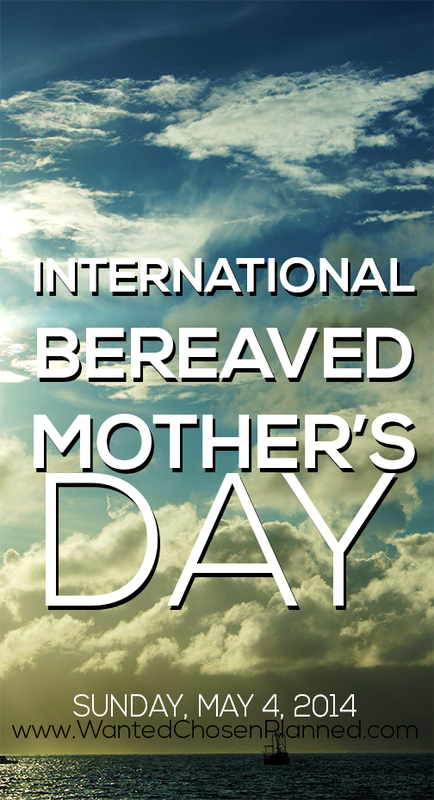 Honor these women with love, support and thoughtfulness on International Bereaved Mother’s Day: Sunday, May 4, 2014. Please visit my post from April 24 to download a digital image to honour the bereaved family member(s) in your life. Click here to visit the post and download the image greeting. Bereaved Mother’s Day is a chance to show yourself love, grace and kindness. You deserve it. No human should have to endure the loss and pain that you have survived, and yet, no matter what, you are still a mother. Join me on May 4 here on Wanted Chosen Planned to discuss the meaning of Motherhood, and also join me on twitter using the hashtag: #stillamom (You can find me: @_Alexis_Marie). I’m looking forward to connecting with you and encouraging one another.